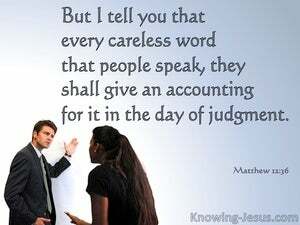 ﻿ Matthew 12:36 "But I tell you that every careless word that people speak, they shall give an accounting for it in the day of judgment. But I say to you, that every idle word, whatever men may speak, they will render account about it in the day of judgment. And I say unto you, that every idle word that men shall speak, they shall give account thereof in the day of judgment. But I tell you, on the day of judgment men will have to give account for every idle (inoperative, nonworking) word they speak. And I say to you, a person will [have to] give an account [to God] on the day of judgment for every careless word he had spoken [while on earth]. But I say to you, That for every idle word which men speak, they shall give account in the day of judgment. And I say to you that in the day when they are judged, men will have to give an account of every foolish word they have said. but I declare unto you, that men shall give an account at the day of judgment, of every scandalous expression they utter. And I say unto you, that every idle word whatsoever men shall speak, they shall give an account concerning the same in the day of judgment. But I tell you, for every careless word that men utter they will have to answer on the Day of Judgment. But I say to you, That every idle word which men shall speak, they shall give account thereof in the day of judgment. And I say to you, That every idle word which men speak, they shill return word for it in the day of judgment. But I tell you that every worthless word that they speak, people will give an account for it on the day of judgment! But I say to you that every idle word, whatever men may speak, they shall give account of it in the day of judgment. But I say unto you, that of every idle word, that men shall have spoken, they shall give accounts at the day of judgment. 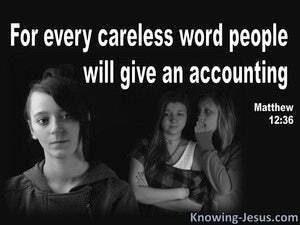 "I tell you that for every careless word that men speak they shall give account on the day of judgment. I tell you that on the day of judgment, people will give an account for every worthless word they speak. But I tell you that every idle word that men speak, they will give account of it in the day of judgment. And I say to you, that for every idle word that men shall speak, they will give account in the day of judgment. But I tell you, That every idle word which men speak, for it shall they give an account in the day of judgment. But I say to you, That for every idle word that men shall speak, they shall give account in the day of judgment. I tell you that every idle word that men speak, they will give account of it in the day of judgment. 35 "The good man brings out of his good treasure what is good; and the evil man brings out of his evil treasure what is evil. 36 "But I tell you that every careless word that people speak, they shall give an accounting for it in the day of judgment. 37 "For by your words you will be justified, and by your words you will be condemned."